Ten of Pentacles says you are offered the gift of wealth, abundance and prosperity through your communication and organizational skills. You are beginning to feel secure, but you still feel slightly detached. Your life will seem to just turn around and security will soon crown your efforts as your finances begin to prosper. You will soon be free from monetary concern. There will be gain in finance or position – a possible inheritance. You will know attainment, recognition and a great feeling of security. Use the wealth of these resources to build lasting structures in the world – make this a better place to live in by leaving something solid and tangible behind you. Support with your gifts the traditions that are meaningful to you – you gain valuable support from your friends, relations and heritage. Leave to those who come after what knowledge you can, but in your wisdom – realize that each new child must repeat the journey. The gate has opened to the hidden experiences in ordinary things, so that you may recognize and appreciate the magic all around you. The angel has come – disguised as a beggar or traveller to test your virtues of hospitality and generosity, then leave a magical gift. By acting in a certain way – you create within yourself the ability to recognize and receive the blessings the world has to offer you. The everyday world contains a magic greater than any of us can see – the magic is all around us. It is in nature and in the very fact that life exists. Know that you are manifesting your visions and graciously accept the rewards. You are a product of your conditioning – free yourself from it. The comforts that you take for granted and the troubles and miseries that you allow to occupy your mind are all a play in which you follow the parts set out for you by your upbringing and society. Go beyond these limitations – walk through the Gate and look down at the little dramas of your daily life. Allow yourself to experience the wild vibrant universe existing in the very center of the ordinary – then return, destroy the negative in your house and re – establish your moral codes. Completion of a major physical/material cycle, with outcomes as you would have them, successful by the applicable standards of measurement. Established success, with visible benefits of your excess carried over for the material benefit of others, as in one generation of a family to the next. Material legacies. Family affairs in business, lasting security. The results of your material success are strategically important to others. Abundance, endurance, maturity, physical longevity – an ultimate extension of self in the physical plane. Here you find the storybook ending “and they lived happily ever after” which means that all of the main characters got exactly what they wanted. The only thing which prevents us from reaching all of our karmic goals is ourselves, in our inability to learn our lessons efficiently. Next to Lovers with Ace of Cups in the spread: Celebration, union and great joy. Devil and Tower with Two Aces in the spread: Upsets – problems with business or career – other people are involved. You need to make fresh new plans and prepare for a new beginning. In the first position: Yours is a path that must accommodate physical and material beauty and abundance. To those on the outside looking in at your obvious material well – being, it may seem as though you have been given an easy route, but your lessons will be tailored to this path, not theirs. In the second position: Here is a man with an army and the war chest to pay them. This is what most of us would like to think of as our resources. In the third position: Physical/material blessings are at hand for you and yours. The longer-term security you have been seeking is coming to pass. In the fourth position: Here is the dream of a little girl to be the princess living in the moated castle with her loving king/ father and queen/mother with all the securities and benefits that go with the package, so secure that the dream has an extended ending in which she has become the queen with her own daughter/ princess. In the fifth position: You are currently working on longer-term personal/family finances. In the sixth position: Whether through inheritance or through self-achievement, much has come your way and its effects will have to be dealt with in all of your relationships, at home, work and play. Quite simply, money changes people. Here too, the effect would be one of profound physical improvement to you personally, in physique or cosmetically. In the seventh position: There is a possibility of using or becoming part of a family venture or the family itself as a venture. A large medical opportunity appears here as well. There could be a genuine need for you to step in and save or preserve the enterprise/estate. In the eighth position: Open up the banquet hall and let the feast begin. There is material abundance available that is more than most achieve in a lifetime. But it is here; it is now. In the ninth position: The heart’s feelings are centered around the material aspects of the family, possibly of all the creative energy that pours from the homestead itself. These feelings may be in the form of an unspoken wish for the warmth and good times to continue indefinitely. In the tenth position: Material opportunities appear to challenge existing goals and expectations. Your work is amazing, and I am ever soo grateful for your help in my journey of studying the Tarot and my life. 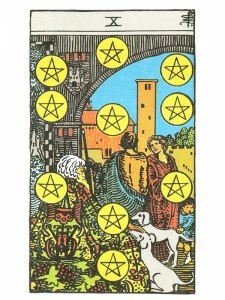 I am wondering if you could say any more about the Ten of Pentacles in the tenth position? I’m not getting a clear perception. . .
Bless and may all good things come your way!